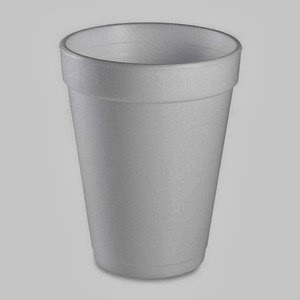 First, Styrofoam is a brand name and is a trademark of the Dow Company. The scientific name for the material is polystyrene or expanded polystyrene, often abbreviated EPS. For the purposes of this article however, we will refer to polystyrene as Styrofoam. Second, when we say that recycling styrofoam shouldn’t be done, by no means are we advocating that you purchase lots of Styrofoam and throw it in the landfill. Actually quite the opposite. What we mean is that you shouldn’t recycle styrofoam… because you shouldn’t be using it or buying it in the first place. Your Health – The primary chemical component of polystyrene is…drum roll – styrene. Studies have shown that over time small amounts of styrene can leak into your food & beverage – particularly hot food and beverage. If you’re a frequent drinker of coffee for example, drinking 3 a day in polystyrene cups, you could consumer as much as an entire cup of ‘styrene’ over the course of a 3 year period. Styrene is also noted as a possible carcinogen by the EPA and the International Agency for Research on Cancer and studies suggest that it is a disruptor of normal hormone functions and may be linked to other hormone problems such as breast & prostate cancer (see GrinningPlanet). It Pollutes our Planet & Water Systems – Styrofoam is a widespread, persistent environmental pollutant, which breaks down into tiny pieces which are often ingested by marine life and other wildlife thus harming or killing them; in some areas of the Pacific Ocean, small pieces of Styrofoam & plastic outnumber zooplankton by up to six times, which may impact marine life such as filter feeders. Styrofoam is banned in over 100 cities across the country – Due to the first 2 points, many cities & counties have banned Styrofoam and if they’ve found a way to stop using it, you surely can. Recycing Styrofoam is difficult – Most municipalities do not offer Styrofoam recycling as part of their curbside recycling program. Thus, to recycle styrofoam you usually have to either drop it off at a recycling facility or mail it in via a program like the Alliance of Foam Packaging Recyclers. Cost – Styrofoam packaging is significantly cheaper than other forms of sustainable packaging (e.g., a case of 1,000 Styrofoam cups could be half the price of a case of compostable cups). And this is the case if you look strictly as the cost you pay when you go to Costco and purchase Styrofoam containers, but this is not the case when you take into account the full lifecycle cost on the planet when you use Styrofoam. We need to start being responsible for the full cost of the things we consume and that includes the negative externalities on our health & planet. “I didn’t purchase it, I just used it because I had no other choice.” Think about a time where you were given Styrofoam and had to use it. Did you really have to use it?? Could you have brought your own re-usable container or could you have asked for another container from the restaurant? Could you have run across the street and gotten a paper cup? Re-usables – Very simple – bring your own re-usable ceramic or glass cup / container. Compostables – There are a variety of packaging products available now (both food packaging and other packaging) that are compostable. Look for products that are certified by the BPI (Biodegradable Products Institute) and meet standards ASTM D-6400 and D-6868 for compostability. So that’s that. You shouldn’t have to purchase or use Styrofoam… and if you don’t use it, you shouldn’t have to recycle it.